A Musical Celebraton of Christ's Incarnation. Composed by Dan Forrest. Choral Cantatas. Christmas. Set of Parts. 200 pages. SoundForth #30/2984SF. Published by SoundForth (LX.30-2984SF). 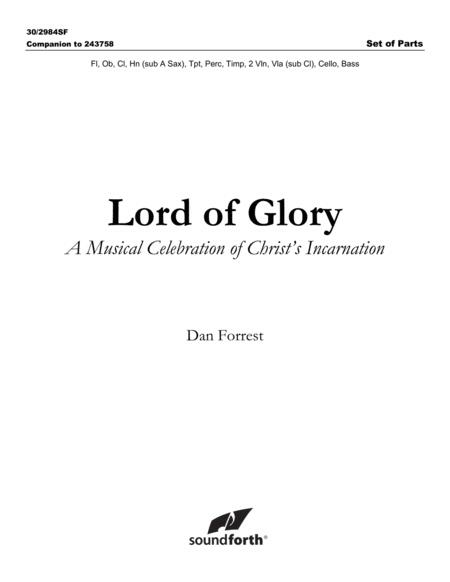 This product is the set of printed parts only for Lord of Glory, and it includes parts for Flute, Oboe, Clarinet, Horn (substitute Alto Saxophone), Trumpet, Percussion, Timpani, 2 Violins, Viola (substitute Clarinet), Cello, and Bass.